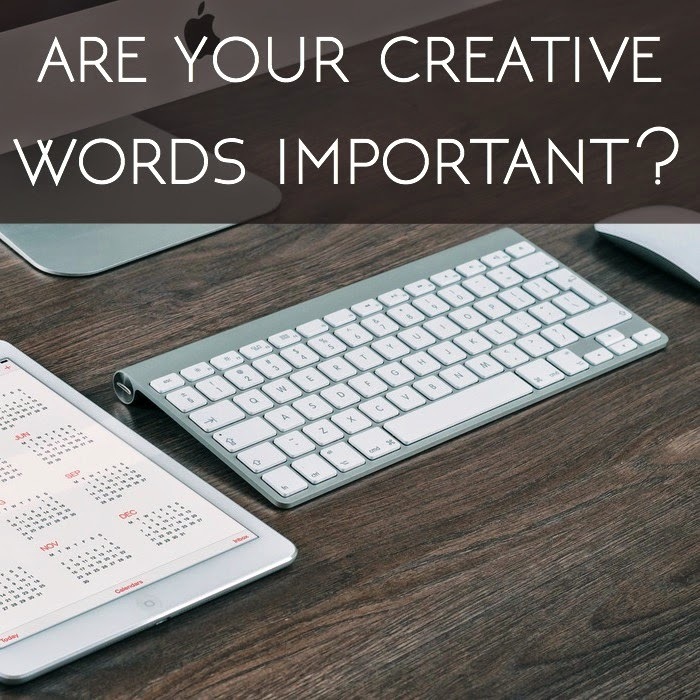 Are Your Creative Words Important? | The girl who loved to write about life. I love words and writing. Creative words and writing especially. Poems and books and stories and even blog posts, taking real life and writing about it creatively. I love writing it and I love reading it. Creative words are wonderful. But sometimes, I wonder if they really matter. This morning, 22,000 words into a book that I hope is actually a book one day, I'm asking myself that question. Does it really matter? Because yes, I love creative words. But they aren't paying my bills yet, they aren't prestigious, they aren't solving a problem. So do they matter? Do anyone's creative words really matter? I have to believe that the answer is yes. Because sometimes, the reality of life is hard. Creative writing isn't pretend. It's taking parts of real life and molding them into magical. It's working through the hard stuff under characters that you pretend aren't you, but you know are, in some small way. It's taking the best things and the worst things that have ever happened to you and polishing them up or roughening them up and turning them into a story that you're proud of. It's solving a problem that you'll never really solve, working something out in the process. It's making words rhyme, because that's something you can do. When you can't find beauty anywhere else, it's making your own. And if you can make the world even just a little bit more beautiful, don't you think that's important? Your words are important. Whether they are fiction or non-fiction, they are still true. And they are important. And if you're a writer, they are important because if for nothing else, they make you come alive. oh i SO needed this post today. I just decided that a book I'm working on needs a totally different direction. then i thought wawit- does it matter? should I just give up? love this! Blogging and writing can be so hard to intertwine at times. There is an abundance of advice out there and it can be a daunting task to find the right advice. I came across many posts saying something along the lines that being too wordy can be a problem. They went on to explain that words that take longer to read should not be used. For example, they said the word utilized should not be used in replacement of use/used. Um? I like big words. I like magical words. I like words that expand my vocabulary. Sorry...not sorry if my words take you a fraction of a millisecond longer to read. I sometimes have to remember, I started my blog first and foremost to write. Yes, it is nice when someone connects with my post and takes the time to comment on it, but I write to live out a passion first. I totally agree. That's why writers write what they know and if they don't know it and want to write about it they gotta get out there and find out. I love words and creating words so it may not matter to anyone else that I wrote a loooooot of words that hardly anyone has seen but it matters to me. God job on 22k! Words strung together to tell a story are very important! You sound like my English teacher, who has been drilling the importance of the dictation of words into our heads all year. As a result I’m now noticing how a different word, conveyed in a different collection of words, can create a subtle difference to the mood of the meaning, and that subtle difference is everything, something a good writer needs to get absolutely correct. love this! sometimes creativity just for creativity's sake is the most important thing! If creative writing isn't important, then songs, music, art, photography, dance, etc aren't important. It's an art form. It's beauty. Your words do matter. Not only from your personal perspective, but they help us, the reader, understand you a bit more, and in order to function to our fullest potential, we must understand. Keep sharing your world, your view, and the beauty that you create. YES they are important! I once had someone say to me that we're not merely created, we are designed. We are designed with talents. If your talent is writing it's because you were meant to write. So, I write and I believe that yes indeed it's important. YES! I love this so much. It's a question that I've asked myself so much. I'm 46000 into my next novel and it's still going to be a while until I finish it. I tell myself that it matters because of some of the discussions that I hope come up from it, but if no one has the conversations that I'm thinking of, will that matter? I have to believe that each one does, no matter the result. Oh my gosh, YES. I ask myself this all the time. But you're right - the answer is always YES. If nothing else, the words fill a void in my life and my soul that nothing else can fill! I LOVE this!!! You give me such inspiration to KEEP WRITING. Gosh I love this. And you. I do get paid to write but not creatively. I ask myself this often, especially when writing my blog. But I live for beautiful words: the ones you write, the ones others write. And I hope others feel the same. I love this post so much! This is something that I ask myself when I feel like I'm going through a rough patch creatively. And sometimes I wonder about it other times as well. Creative words aren't paying the bills (yet) and so far nothing has been published, so my creative words aren't even reaching anyone else. But they are important to me, and that's enough.